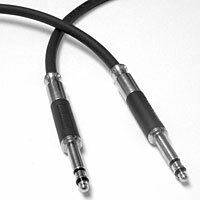 Made with a flexible yet durable cable that is manufactured using nickel plated Neutrik TT plugs. Using nickel plating as a standard helps to eliminate problems of corrosion and tarnish build-up. Each TT plug has a hex crimped strain relief to provide the ultimate in stress protection for the solder joints and actual cable. The cords are offered in five colors, that are matching between cord and plug sleeve for easy identification.